There are two sides to iconoclasm – the good and the bad, but I’m going to suggest a third characteristic – ugly, which is also bad, and should be viewed as such by all sane people. Challenging established beliefs, customs, traditions and values is good. It is the act of embracing new knowledge. Scientific discovery is dependent upon confronting old ideas and beliefs and leads to technological innovation, which overall is good for the progress and advancement of the human race. Skepticism and critical thinking are the natural by-products of good iconoclasm, or is it the other way around? The reason why we don’t have people suspected of witchcraft being regularly burned at the stake is because of good iconoclasm. But isolated incidences still occur in some parts of the world; the parts that resist change to new ideas. However things are significantly better in the modern era. The wanton destruction of religious artefacts, including those of archeological significance is barbaric, backward and symptomatic of a retarded mindset. In recent years there have been several incidences of the senseless destruction of these objects. The bombing of the Bamiyan Buddhas in Afghanistan by the Taliban and the desecration of tombs in the ancient Malian city of Timbuktu by Islamists, come to mind. However, history is littered with the malicious destruction of places of worship and religious artefacts, by various proponents of the world’s religions. Off course it is not only religious fundamentalists who carry out these senseless acts of devastation. Other bizarre ideological beliefs whether political or social, have also been the prime motivator for the same inane act of destruction. I don’t suppose this category actually exists, but I’m going to stick my neck out and propose it by providing an example. Nohmul is a Mayan archeological site in the Yucatan Peninsula near Belize. Recently a pyramid dating to around 250 BCE was found to have been almost completely destroyed by building contractors, who were using the gravel and limestone content for constructing a nearby road. The owner of the excavation equipment was revealed to be a local politician, although it has not been proved that he ordered the destruction of the pyramid. This type of iconoclasm is rooted in greed. Defacing priceless treasures of our human heritage to make a quick buck. 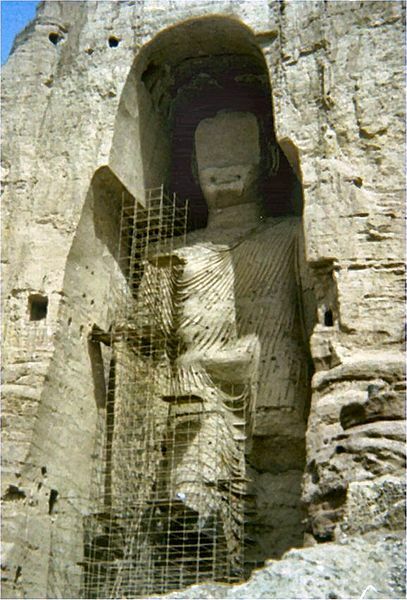 This entry was posted in Education, History and tagged 250 BC, Afghanistan, archaeology, Bamiyan Buddhas, Belize, fundamentalist, Iconoclasm, ideology, Islamists, Mali, Nohmul, Taliban, Timbuktu, Yucatán Peninsula by lennymaysay. Bookmark the permalink.